If you're in the mood for Chinese takeout but wishing for a healthier option, this Asian-inspired dish is your answer! Using cauliflower rice instead of cooked white rice is an easy substitute to cut back on calories without losing flavor. Diced chicken is glazed in a mixture of Asian pantry staples like soy sauce, rice vinegar and chile-garlic sauce—plus, the entire dish is ready in under 30 minutes. Who needs takeout when you can have dinner on the table in the time it would take for your meal to be delivered? Be sure to serve with cashews and chopped green onions for contrast and freshness. If you'd like a thicker sauce, make a slurry by whisking 1 tablespoon cornstarch with 1/3 cup cold water. Whisk into sauce with chicken and and simmer until thickened, about 1 minute. Ladle any extra sauce over cauliflower rice. Per Serving: 447 calories; 17g fat; 13.3g carbohydrates; 58g protein; 152mg cholesterol; 1716mg sodium. First time I ever tried making cauliflower rice and I loved it! However, not sure if it was me or the recipe but the sauce was way too salty for my taste. Perhaps less oyster sauce and more sugar would solve that issue. I used back sesame seeds to top it off. 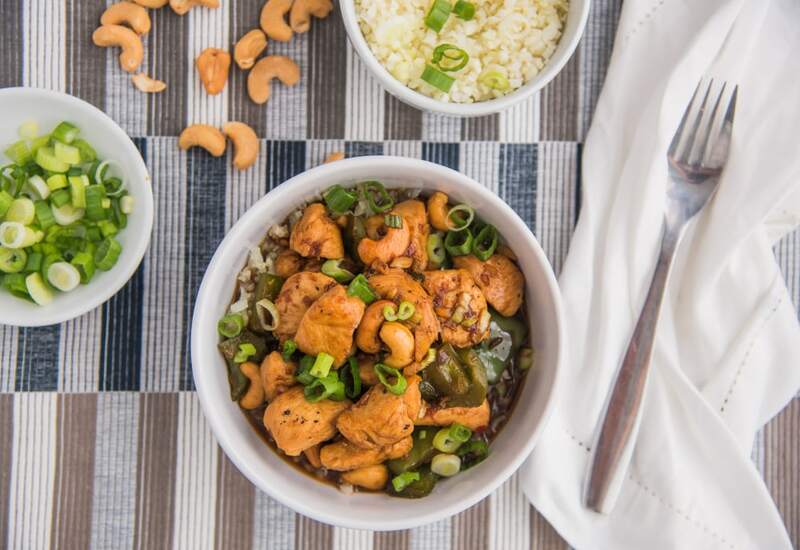 Cashews and chicken work so well together, and this dish demonstrates why. Add in the cauliflower rice and you have a hearty and filling meal. I love the zing from the ginger and rice vinegar as well. I made a slurry so that the sauce would thicken some. Best decision ever, it was delicious and perfect over the cauliflower rice. Also, I made the cauliflower rice in my pressure cooker. Probably going to try to make the entire dish in a pressure cooker. Made the cauliflower rice and cashew chicken at the same time in my pressure cooker using the convenient steamer basket feature. Took me a couple of tries to get it just right, but it's perfect. Love this recipe, so good. Made the cashew chicken but didn't do cauliflower rice. This was a great recipe. The meat was really tender and full of flavor. Also, the tip to make a thicker sauce was perfect.